Board and card gaming with a Louisiana flavor. GEN CON 50 is almost here! We are packed up and ready to go, but we are leaving some room in our suitcase to bring back some goodies to the Gumbo Game Night Krewe. Ca fait chaud! This is the final part of our preview of the games we are excited to see at GEN CON. Let us know what you think about these lists by hitting us on Twitter or on Facebook.For the earlier parts of our series, go here for our first list of games, or here for our second list of games. Published by Z-Man Games (2017), booth #1429, designed by Stefan Dorra with art from Klemens Franz. Matthew Ward (WAM! Boys, Dukes of Dice) – A city building euro with hand management and Klemans Franz art. This one is high on my list to try. Ever since I played Oh My Goods! I have been looking for more of this style of game. Stefan Dorra has created some great games like For Sale and Medina, and I am hoping this is his next big hit. Published by Bézier Games, Inc., designed by Ted Alspach, booth # 2627. Bryan – I am always up for a new tile placement game. I enjoy Castles of Mad King Ludwig, Castles of Caladale, and Cottage Garden, so I suspect I will be looking into this game as well. Published by Arcane Wonders, booth #841, designed by Gil d’Orey and Antonio Sousa Lara. BJ – Arcane Wonders has been on a roll with their partnership with The Dice Tower in its Essentials line. Can the streak continue with Viral? Definitely a unique theme, and I like the fact that they are handing out “thousands” of promos for it. Not a must buy for me, but temperature gauge? Warm interest. BJ – I am a sucker for dragons in aboard game, and I love deck builders. Plop a D&D theme on a deck builder, and it’s a “must try” for me. I haven’t seen any videos or reviews on this one yet, so it’s a little bit of a mystery to me, but I plan on checking it out for sure. Bryan- I am honestly on the fence about this one. I love deckbuilders but based on what I can find of the game I am not sure what things they are going to improve over the already existing adventure deck builders out there. I really want this game to be good, and I will definitely check it out, but I will reserve judgement until that time. BJ – this is a placeholder of sorts. Oink Games makes its Gen Con debut this year. I’ve only played Deep Sea Adventure but ALL of their little box games look intriguing. This one looks the most interesting of all the cross overs they are bringing, but I could replace it with Insider or any number of other titles. Temperature? Very hot! BJ – I have looked longily at Robinson Crusoe for many moons, but never pulled the trigger. Maybe if Carlos hadn’t moved to Iowa, either Robinson or First Martians would be higher on my list because that’s the kind of game he and I would enjoy bringing to the group. In any case, Portal Games has a lot of hype going for this one, and why not? It has a cool theme, integrates with an app to (supposedly) give it uber-expand-ability. Logically, this should be high on the temperature gauge, but I’m gonna call it a look see for me. I want to demo it before I commit. But, man, the theme really calls to me! BJ – Okay, this one I am going on gut instincts here. First, I like the designer. Space Cadets Dice Duel and Pit Crew (which come to think of it, should be on this list somewhere) are both favorite game experiences of mine. Two, I liked the book. Three, I’ve never watched the series…wait that’s not necessarily a good reason. This is a “need to check it out” but “it has what I like” kind of game. Bryan- I am hoping to demo this game and maybe buy it. The premise is interesting to a history buff like me. You play as a coven of witches trying to help the Americans during the revolutionary war. The game is a co-op deck builder, so I already have some idea what I will be looking at. But the theme and game play will really be the selling points here for me. Also if i can sink British ships with some eye of newt and bat guano, so much the better. Bryan – I missed the kickstarter for this game, and I don’t believe that was a bad thing. 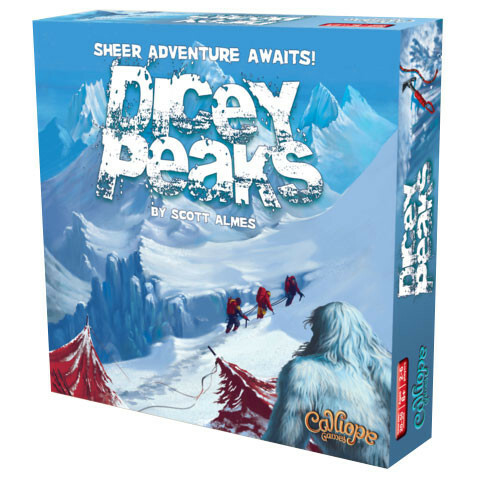 The game was designed by Scott Almes, who is a pretty well respected designer. And the game looks interesting, a light, push your luck style game that falls in with Welcome to the Dungeon and Celestia. The only thing that hold me back is I am not sure how long the game is and how if a good streak can end the game quickly. I will most definitely check this game out, and make a final decision on whether or not i buy it then. Bradly – Eric Lang is obviously known for a lot of good games. Blood Rage is probably my favorite from him. Rising Sun seems to be fairly similar (dudes on a map game) but with a heavier lean towards diplomacy rather than full out fighting. Having kickstarted this one I have high hopes. Bradly – Gloomhaven is an excellent dungeon crawler, but Founders is a hard turn from that style of game. It’s a competitive city builder, in essence; similar to something like Murano. Players are laying tiles to build up the city and getting benefits from those tiles. The game is also asymmetric; each player is a different race that specializes in a certain resource, and the best resources can only be gained through cooperation. BJ – I covered this one on the What Did You Play This Week Podcast, but I will tell you that the board art pops out on the table. It has a unique theme set in earlier times in India, and has the look of a good, thinky Euro. The designer also designed La Granja, so there is a pedigree. I am looking forward to trying this one at GEN CON, and getting a first look at the stunning artwork by Michael Menzel. Bradly – Despite enjoying the video game version of Hand of Fate, I decided not to back the board game when it came up on kickstarter. It follows the same general landscape of the video game; building up a hands of cards to take into encounters and, hopefully, win. But I think, ultimately, that the board game version will pale in comparison to the video game. I hope I’m wrong, but I definitely plan to try this one at Gen Con to find out. Bradly – I honestly don’t know a lot about this game. 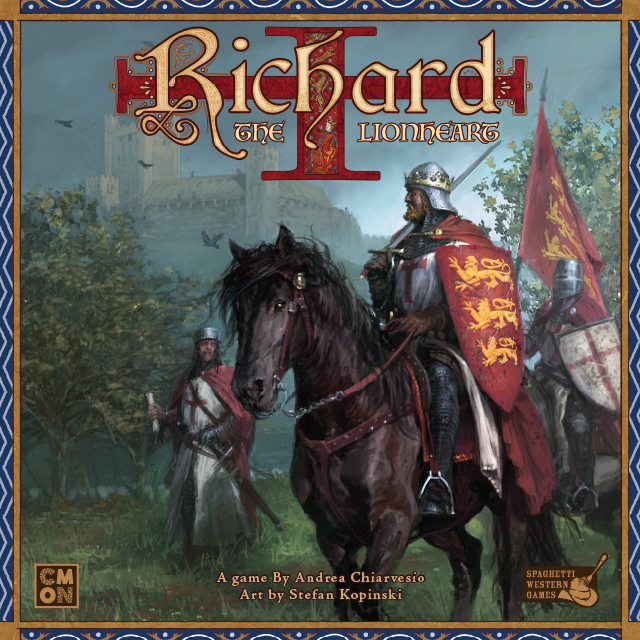 I know it takes place during the time period when Richard is away from England at the Crusades. I know it involves a version of area control as you vie for political and military control of portions of England. I know King John and Robin Hood are somewhere in there. But what the exact mechanics of the game are escape me. Even with what little I know about the game, though, I am still very excited for it. The Crusades is a theme that will always get my attention, so I’m looking forward to demoing this one at Gen Con. So that wraps up our series on all hot games we are interested in buying, plus a few more games that are only available for demo at GEN CON 50. Tell us what you think by hitting us up on Twitter or on Facebook. Until next time, Laissez les bon temps rouler! Board Game Gumbo Blog is a proud member of Punchboard Media, a supportive network of board game media content creators committed to promoting games as a way to bring together families, friends, and board game enthusiasts across the globe, while advocating for openness, fairness, and inclusion in the community. Visit punchboardmedia.com to check out content from all our members: audio podcasts, written reviews, video content, how-to-plays and more!